For the past several years, Kingsbury has been revamping the design of its CH System, a combination thrust and journal bearing, that was first developed more than 75 years ago by the company's founder himself. Dr. Kingsbury was looking for a way to simplify the use of hydrodynamic bearings on applications such as pumps, and with the CH System, he was able to eliminate the need for an external pump and motor system to feed pressurized oil to the bearings. One of the goals of the revamped CH System was to standardize as many features and components as possible, as this would facilitate manufacturing and appreciably shorten lead times. Kingsbury engineers decided to reduce the number of standard configurations from nine to four, and to make the new units adaptable to a wider range of shaft sizes. In mid-2012, Kingsbury booked its first order for the smallest size of revamped units, designated CH-1 and C-1, while the technical staff finalized details on the other three configurations. In early 2013, work began on a new catalog to replace the existing edition of the CH System catalog, which is now available by downloading from Kingsbury's website library, http://www.kingsbury.com/library. Note: The online catalogs include animations that illustrate how the integrated oil circulation system functions. 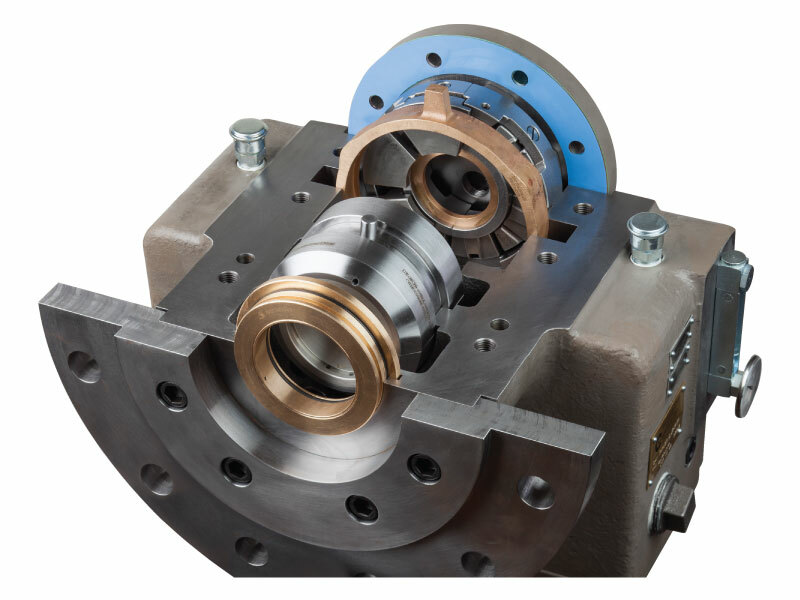 The system consists of a CH housing that contains two thrust bearings and a journal shell to support the shaft load, and a separate C housing with a journal bearing to support the drive end of the shaft. The machine is positioned between the two units. The CH System is ideally suited for pump applications, as the sliding velocities and bearing loads are typically moderate. The oil circulator, working in tandem with the thrust collar, serves as a viscous pump and delivers oil not only to the non-drive end thrust and journal bearings, but also to the isolated drive-end journal bearing. Lubricant is cooled in a heat exchanger integrated into the CH unit, so the system provides everything required except the piping between the two units. The self-contained CH unit does away with the considerable expense of a lube skid and assures that oil is always circulating to the bearings while the shaft is turning, thereby making a backup lubrication system unnecessary. Headquartered in Philadelphia, PA, USA, Kingsbury designs and manufactures a wide variety of standard and custom fluid-film thrust and journal bearings for rotating equipment applications, including hydroelectric, gas and steam turbines; compressors, gearboxes, pumps, air preheaters and ship propulsion systems. The company has maintained its position as the industry leader through continuing research and development, engineering integrity, and world-class customer service. For more information about this announcement or about Kingsbury, Inc, contact Mark Kuhn, Business Development Manager,10385 Drummond Road, Philadelphia PA 19154 USA, Tel. +1-215-824-4000,	E-mail: sales@kingsbury.com.